For Gail Rush and myself it is the last wrestling season. Our sons have wrestled since they were little boys and as parents, we have followed the journey from the very first takedown, from kids through the high school level to the collegiate wars. Clayton Rush and Mario Morgan were arguably the two best non DI wrestlers from Illinois in America entering the 2010-11 college season . It has been a long road to this point for them. This is their story. When I started this column many years ago, I wanted to share our experiences in the wrestling world. I was not a wrestler and had no one to tell me how this all was suppose to go. Eventually I figured most of it out, through trail and error and even became nominated last year for Illinois Wrestling Reporter of the Year by Illinois Wrestling Officials and Coaches Association. While my sons, competitive college career winds down, I much like Gail will be torn with many, many emotions and flooded with even more memories. In a strange way we will gain closure through our journal of our experiences of the wrestling lifestyle. Stay close to this column, Gail and I will update our experiences. In chapter 16 Clayton discovers Greco - Roman wrestling and a national title along the way. This chapter features Clayton's experience only. Mario will return in chapter 17. I finally get to talk about my favorite style. Greco. Shortly after Clayton’s season ended his freshman year, he got a phone call from this guy, Craig Fallico. Never heard of him, but then why should we? He was, after all, north of I80! Anyway, he wanted to know if Clayton would be interested in being on the National Junior Greco Dual Team. Junior? He was Cadet age. Hmm. Interesting. And even more interesting was the fact that not only had he never competed in Greco, he had never even practiced it. I think he may have been 1 of maybe 3 kids in the entire state of Illinois in high school that could make 98 pounds. We talked about it and the decision was made. Yes. We had no idea what we were in for and actually how difficult the first year was going to be to learn this new style. And speaking of I80, did you know there is nobody south of I80 that does Greco. There are no clubs that practice it. We had only one option. Bam Pustelnik. I called Bam and we arranged to get some tapes from him from the Junior Olympics. We watched the tapes. That was it. It was all we had. He was off to St..Louis for training camp and all set up to met what would be some of the most influential coaches and teammates he would ever have. I would love to talk in detail about each of the 4 tournaments, but that would easily turn this chapter into it’s own book. I’m will somewhat briefly do each season, or I guess I should say “briefly” is my plan! I’m actually not sure where to start. The coaches…Coach Fallico, Coach Wetzel, Coach Kirgan, Coach Holland, Coach Flores, Coach Powell. The teammates…Matt McNasty McNaughton, Brett Robbins, Mike Tamillo, Connor Beebe, Daniel Dennis, Cartice Lloyd, Jimmy Chase, Jonathan Drendel, Vlad, Peter Kowalczuk, Mark Cadet Stenburg, the brothers Williams, the brothers Bokowski, Big Joe Fagiano, Scott Power Bomb Penny, BJ Futrell, Peter Lovass, Max Nowrey, Danny Malouf, Cory Stassi (he named a pair of his shoes his “Stassi’s“…he got them from Cory! )Mark Schultz, Rick Loera, Danny Monaco, Lillishawn Coleman, Izzy Montemayor…there were so many amazing kids and I think I could tell a story about each one. Bubba still keeps in contact from time to time with a few of the boys, and I, of course, still follow closely those who are still wrestling in any style. 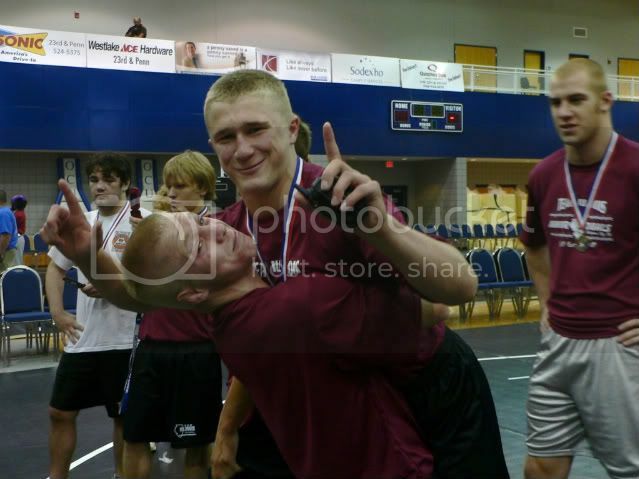 Clayton had to compete in Greco State his freshman year to earn his way onto the team. Actually, he was supposed to compete all 4 years at Greco state, but injuries prevented that from happening his sophomore and senior years. 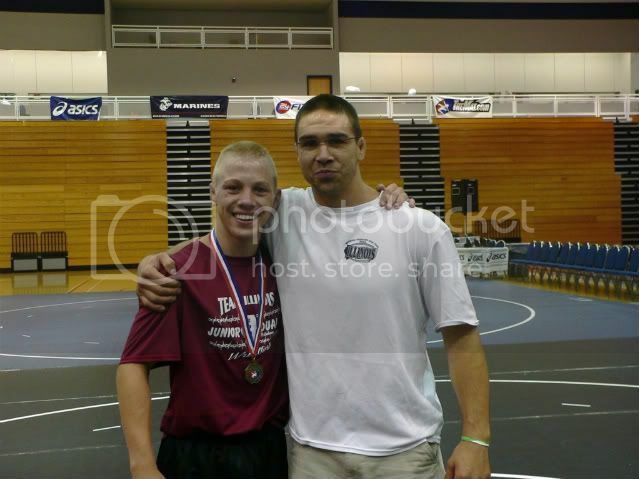 He won FS state and Greco state his freshman year and only competed in Greco State his junior year and won that too. He really amazed me at this new style. The only practice he had was at the training camps and maybe throwing somebody around in our room here at home…if he could find anybody that would let him! 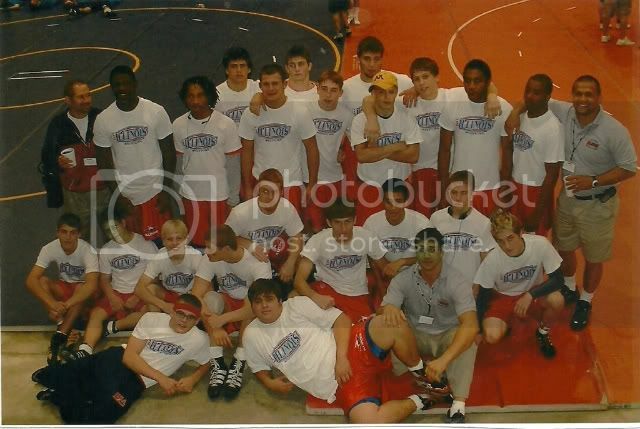 He had some big wins over the years at he Duals…Jordan Oliver, Donte Butler, Kellen Aura, and my two favorites, Andrew Long and Zach Sanders. There were probably others but those are the ones I remember the most. Each year our Greco team got better. Enid, Oklahoma 2004. Where in the heck is Enid, Oklahoma? Well…it’s where the Duals were!! If I remember right, his freshman year he was at 98 pounds and they won the consolation bracket with Coach Falico, Coach Powell, and Coach Flores. I give ALL the credit to these 3 coaches for Clayton developing a love for Greco Roman wrestling. They were so knowledgeable and just plain fun. Coach Falico was always dancing and Coach Powell and Coach Flores were amazing. They, along with Coach Kirgan took a kid who had seriously no knowledge of Greco and turned him into a real competitor. Brett Robbins was my hero that year. He wrestled his last match literally on one leg. He had injured his ankle early in that match rather badly and couldn’t put ANY weight on it. He sucked it up and not only finished the match, but won! And Bubba looked at Greco as his “break”…a break from shooting and from having to defend shots. It was so foreign to him that is was more like a completely different sport. I loved it from the start…ok…maybe not the very start, but from when I finally understood the rules and the scoring! Bub’s senior year was again in Oklahoma City. He was at 119. I always drove to the Duals. I didn’t mind the drive. Bubba’s freshman year Courtney flew into St Louis and drove with me…she shopped and slept while I watched wrestling!! His sophomore year Rick went with me and junior year I drove by myself and FINALLY his senior year Rick went again. I insisted. He had missed out on so much fun that I told him I didn’t care about work…he was coming. And he was glad he did. Clayton always rode home with me, with the exception of his senior year. We picked him up at the airport in St. Louis. His junior year we stopped at the National Wrestling Hall of Fame in Stillwater and got to meet Pat Smith and watch Eric Guerro work out…pretty cool. Anyway, back to the duals. We had a few new faces on the team…and what a line-up we had! Top to bottom we were solid. We won our pool. And Clayton reached one of his goals. All he ever wanted to do was to be like Scott Penny and do a power bomb. He finally got to do it…and almost got kicked out of the tournament. Luckily only one official thought that…the other two didn’t. We won the first one in the championship bracket. We won our second one in the championship bracket. One more win and we were in the finals. And we had Iowa. 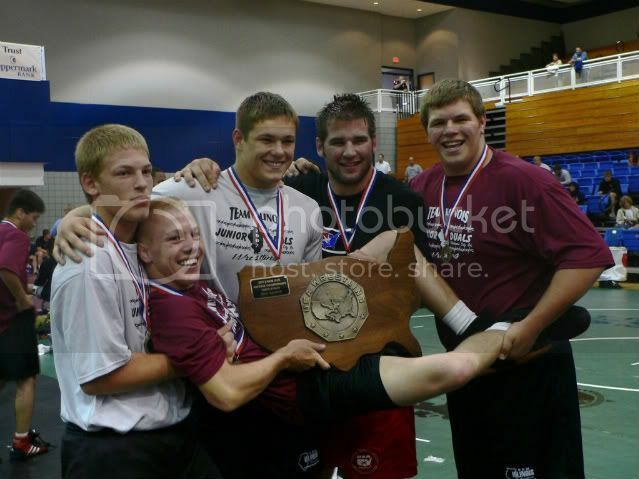 Their team was literally a “who’s who” in Iowa high school wrestling. And funny thing…Coach O, Coe’s head coach, had driven to Ok. City to watch the duals. He left before the dual with Iowa. I’m pretty sure he thought Iowa would win with ease. BUT Illinois Greco would have none of that. I thoroughly enjoyed calling him to tell him about the dual that ILLINOIS won!! Here’s the line-ups and results. Huge win for us and now we have Minnesota in the finals. We had a killer start to most duals. Max, BJ, Kent, and Clayton. They all won their matches. Clayton beat Zach Sanders, which was huge and really got the team fired up and we could see that we could actually win this dual! Jimmy won at 130. Danny won at 140. Mark “Cadet” Stenberg won at 145. Scott Penny won at 189 and Peter won at 275. If you know anything about the team scoring at the duals…it was huge that every one of our guys that lost scored a point, which gave us one team point. Every kid did his part and WE WERE THE 2007 USAW JUNIOR GRECO DUAL NATIONAL CHAMPIONS with a score of Illinois 38 - Minnesota 23!! What a blast! The boys were crazy…running and sliding on the mats, yelling…us parents were of course yelling and hugging and taking pictures. I think we outlasted the boys when it came to taking pictures! There is absolutely nothing I would do differently. Nothing I regret except that it was over. I’m positive Clayton would 100% agree. If you have a son who has the opportunity to wrestle on a dual teaam, DO IT! 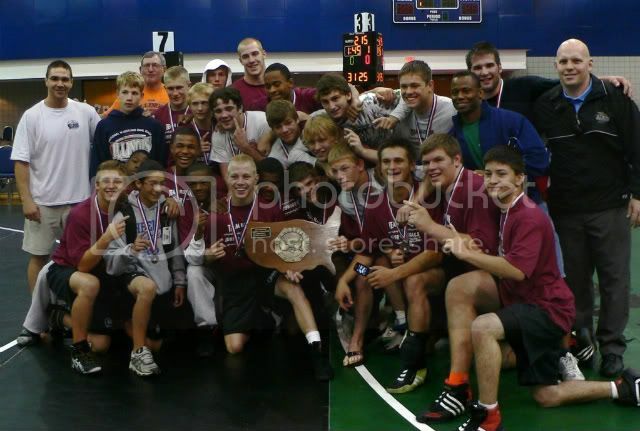 Some of my best memories, and I have a lot, are from the Greco Duals. I can’t say enough about the boys… and Coach Powell…well…he will always be the toppest of the top notch in my book. I miss Coach Powell. I miss the boys. I miss all the parents who became my friends. I miss the Duals. I miss Greco…. Last edited by MR TWISTER; 12-30-2012 at 03:02 AM.